Here is How To Get Listed on HTTPS Everywhere Atlas With a HSTS Domain. Only Making Website HSTS Will Not Work, You Need to Inform the Browsers. It is true that Google has an Appspot application where they manually sort out the eligible HSTS websites after submission, but basically there is an Atlas of HSTS website.That is maintained by Electronic Frontier Foundation. These rules actually are applied at browser level. They are shipped with the set or something like that. We used free SSL certificate of CloudFlare for that thecustomizewindows.net domain. The chance that someone will ever open https://thecustomizewindows.net is quite rare. Today we updated to these rules. Akamai and Google’s subdomains were not in our secure cookie list. So, our CORS was only determinant. This Article Has Been Shared 883 Times! Hybrid cloud is regarded by many as the best way to leverage the potential of cloud computing. But in practice, projects often gets uncontrolled. 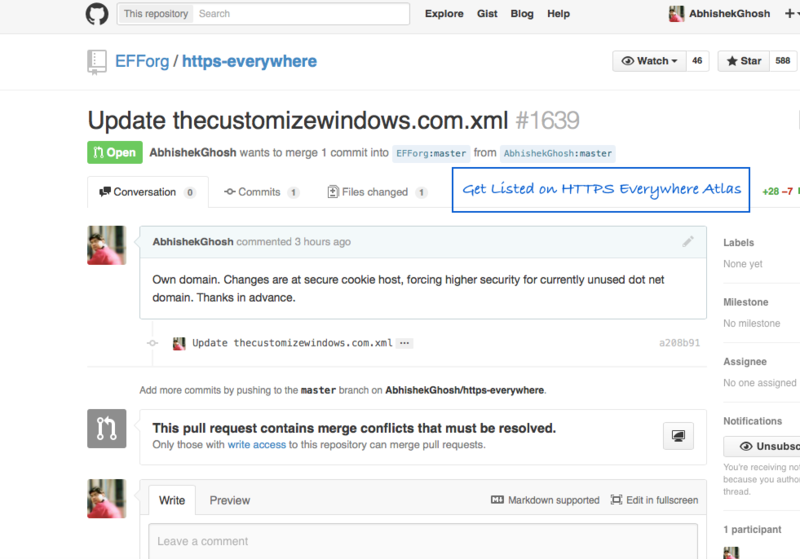 Cite this article as: Abhishek Ghosh, "Get Listed on HTTPS Everywhere Atlas," in The Customize Windows, May 6, 2015, April 21, 2019, https://thecustomizewindows.com/2015/05/listed-https-everywhere-atlas/.